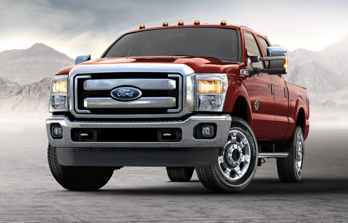 The Ford F-250 is a champion of Ford design. 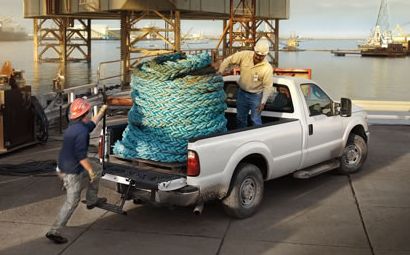 These workhorse trucks give Ford drivers all the tools they need to ensure they can get the job done right the first time. If you’re looking for a F-250 but aren’t sure of the features you’ll need, continue below to learn more about F-250 features and information or contact or visit us now. The F-250 XL will come standard with a 6.2L SOHC 2-valve Flex Fuel V8 engine with an impressive 385 horsepower and 405 lb.-ft. of torque. Also available on the XL is the 6.7L 4 Valve Power Stroke® V8 Diesel Engine which will give your truck additional power so you’ll never be in short supply. Ford 6-speed TorqShift® SelectShift® means your Super Duty is engineered with superior strong gears that can take on the workload of your demands. Also included is the Safety Canopy® System with state-of-the-art roll-fold technology. This safety system is in addition to the 6 standard air-bags. The XL will also include Trailer Sway Control with Roll Stability Control which will help, through adjusting engine power and selective braking, increase stability and control when towing large loads. The F-250 XLT will include upgraded mirrors with heated glass to insure the best visibility at all times. These telescopic side-view mirrors will help to see your load you’re towing. XLT owners will also receive access to a complimentary 6 month subscription to SirusXM Satellite Radio where they can listen to over 130 radio stations free from commercials. SirusXM radio programming gives you the best in sports, news, music, talk radio, and much more. Also available is the 40/20/40 seats which will allow one more passenger to ride in your front seat. When you don’t need to hall 3 passengers up front, simply put the seat back down and enjoy access to the center console and cup holders. The 40/20/40 seats are also available on the XL trim. The F-250 Super Duty Lariat Trim gives Ford owners the option to switch between 2WD and 4WD High and Low via the Electronic Shift-On-the-Fly Transfer Case. The auto/manual locking hubs will let you switch on the fly so you won’t miss a beat. The Lariat also equips drivers with a supreme Sony audio system. Your music will sail through 9 surrounding speakers as well as an added center speaker. This audio system is standard on the Lariat Crew Cab, King Ranch, and Platinum trims. Also included on the Lariat is the SYNC system which includes an 8 inch interface monitor that will streamline your access to climate control, audio, and even navigation systems both by touching the screen or wireless through voice activation. Another available feature of the Lariat is the tailgate mounted reverse camera. This application will display through the center console, a live image of your Lariat in reverse. This can be especially helpful when you need an extra pair of eyes for quickly hooking up a trailer. The iconic F-250 King Ranch model includes unique leather seats with embedded “Running W” stitching as well as standard 40/20/40 seats up front. The powerscope side mirrors come equipped standard with clearance lights and turn signals as well as a memory feature that makes it easy to quickly get the perfect vantage of your surroundings. Powerscope mirrors are also standard on the Platinum trim and available on the Lariat. Also available is the upgraded Navigation System which streamlines SirusXM traffic information making it easy to know the quickest route wherever you go. Also available on the King Ranch is the two tone lower accent paint with wheel-lip moldings to give your Super Duty the look and feel you expect from the Ford brand. 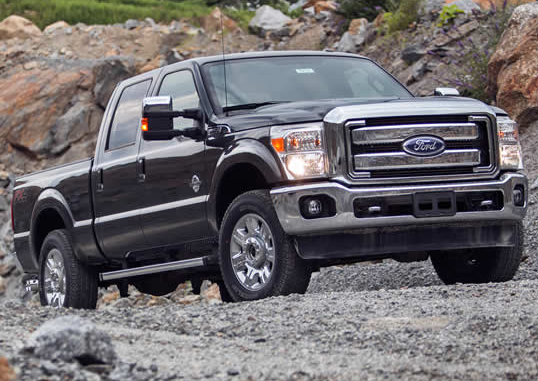 The F-250 Platinum Super Duties are the intersection of toughness and luxury. These capable, stylish trucks not only give you the tools to get the job done, but give your F-250 accents that make it your own. Satin and chrome exterior elements, 20-inch cast-aluminum wheels and the genuine walnut swirl wood and leather interior make your super duty feel like the high quality tool it is. The SYNC system with integrated navigation and HD radio means you’re as connected as you want to be. This Super Duty is the real deal. 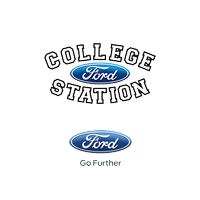 To find out more information about features and available options for F-250 Super Duty trims, give us a visit at Tomball Ford or contact us online now so we can prepare your exact model for a test drive.